Norman (Kodi Smit-McPhee) sees dead people. Lots of them. All around the town of Blithe Hollow, the spirits of those who died violently or otherwise have reasons for not yet moving on converse with the glum adolescent who gets bullied at school for being a freak only to come home to a father who doesn't understand him. At least Grandma accepts Norman as he is, but unfortunately she's dead. As is often the case in kid flicks like this, Norman's curse turns out to be a blessing in disguise. The spirit of a witch who was put to death hundreds of years ago put a curse on the town. Norman's Uncle Mr. Prenderghast has been keeping this supernatural vengeance at bay for years, but it's clear that won't go on much longer. So it falls on Norman to use his ability to talk to the dead to try and save the very people who ridicule him. Look, we all know how this is going to turn out; it's a kid's movie, after all. Nothing too bad is going to happen. 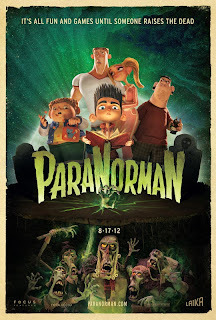 It's not the destination that matters, but how much fun we have getting there, and PARANORMAN provides its audience with more than sufficient fun from the opening zombie movie parody on through to the inevitable “believe in yourself” moral at the end. I would have loved this as a kid, and I imagine the more macabre minded youngsters of today will dig it as well. 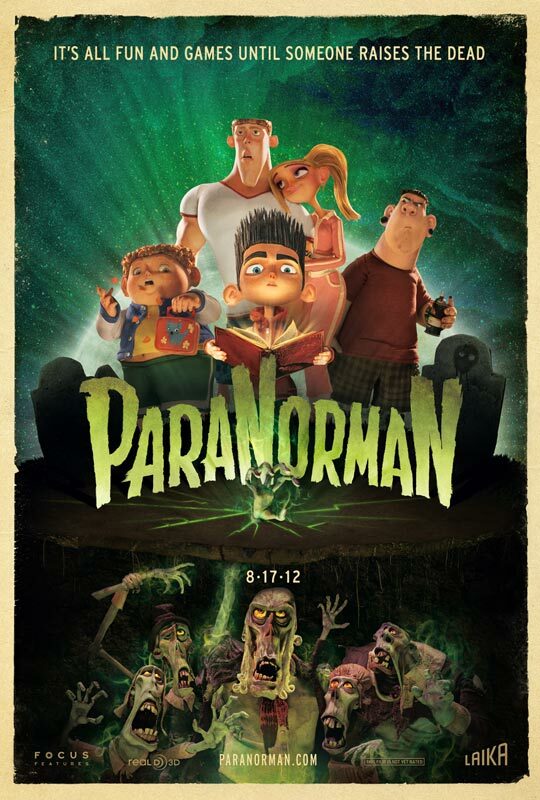 PARANORMAN even has something to offer for the adults. Without being too overt about it, the film pays homage to seventies drive-in/grindhouse zombie flicks from the get go. While much of the soundtrack is orchestral, whenever some supernatural threat rears its head, throbbing seventies synths get added to the mix. The plotting is still about as slapdash as it usually is in most of these CGI kiddie flicks, but there's a genuine heart beating underneath it all and enough clever gags that it's worth a watch. 2 1/2 out of 4 stars. I might have to take PJ to check out this one :). We did love Coraline.